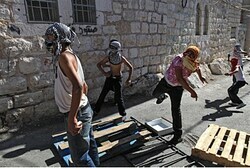 Nineteen Jerusalem Arabs have been arrested with various forms of attacks on Jewish drivers passing through the capital. Police officers and personnel from the Israel Security Agency (Shin Bet) arrested 19 residents of the Abu Tur neighbor in a sting operation Thursday. All of those arrested were charged with hurling firebombs, firecrackers and rocks at vehicles with Israeli license plates. The suspects are also accused of torching vehicles. Arab attackers in Jerusalem – and elsewhere – have grown increasingly bold over the past few weeks. An Israeli man was wounded last week in a rock throwing attack near the Mount of Olives cemetery. In the same week, a Jewish motorist barely escaped with his life after an Arab mob attacked his vehicle as he drove through the neighborhood of Wadi Al-Joz. Attackers hurled dozens of rocks and a concrete block at the car, smashing the windshield and wounding the driver.